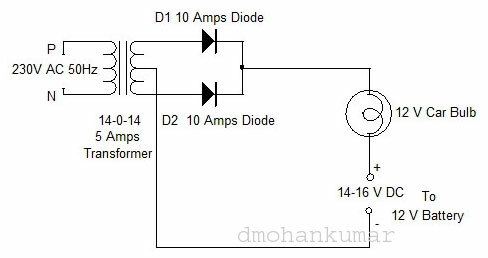 This Charger circuit is simple that provides “Raw DC” for charging. It is better to charge the Lead Acid battery with “Pulsed DC” so that the charging process will be efficient. The “Pulsating DC “ agitates the electrolyte so that electrons pass more efficiently. 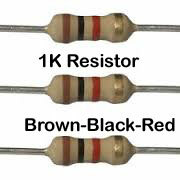 Usually a “Smoothing capacitor” is provided after the rectifier bridge to make “Clean DC”. 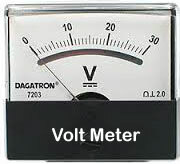 Even though the diodes converts low volt AC to DC, the DC will have some fractions of AC. This DC is called as “Dirty DC ”. 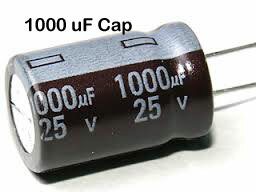 So to remove the ripples from the DC, a high value “Electrolytic Capacitor” is used. Here the capacitor is omitted and the dirty DC is used for charging. 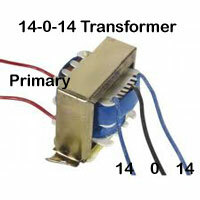 A 14-0-14, 5 Ampere “Step-Down transformer” converts 230 volt AC to a low volt AC around 18 volts. 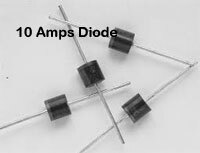 The 10 Ampere diodes D1 and D2 convert the low volt AC to DC around 16 volts which is used for charging. 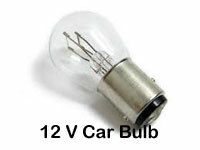 A 12 volt Car bulb (one used in tail lamp) is provided in series with the positive line. This bulb restricts the charging current and also functions as a “Charging indicator”. The brightness of the bulb indicates how much charge is flowing into the battery. When the battery becomes fully charged, lamp turns off. If the lamp is staying on with full brightness for more than 30 minutes, it indicates that the battery is dead and is not accepting charge. The Bulb is a very good indicator for charging status. 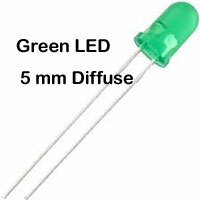 It is connected in series with the positive output rail so that current flows through the bulb into the positive terminal of the battery. From the positive terminal, current passes through the battery chemistry into the negative terminal and then returns into the transformer. 4. Bulb first brightly on and then gradually dims and finally the filament appears red hot – Battery charging normally and finally charging completed. 5. Bulb stays ON after 30 minutes without reducing the brightness- Battery dead and not charging. The charger circuit is similar to the above one but a “Volt meter” and “Ammeter” are connected to get charging voltage and current. 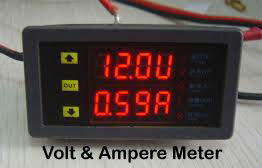 Ampere meter (Ammeter) is connected in series with the Positive line and the Volt meter is connected across the Positive and Negative lines. 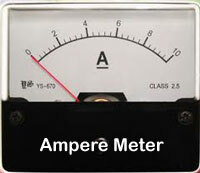 You can use either Analogue meter or Digital Meter. Now Digital Volt and Ampere meter in one pack is available, so it will be more suitable and you can observe minute changes in voltage and current easily. This charger can be used for charging NiCad, NimH, Li -Ion battery and also Mobile phone battery. 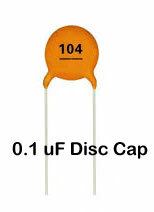 Here a “Smoothing capacitor” (C1) is added to get “Clean DC”. 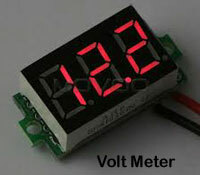 A Voltage regulator IC (78XX) is provided to give stable voltage for charging. Output current from the IC is maximum 1 Ampere and voltage depends on the IC type. 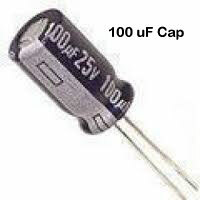 Capacitors C2 and C3 reduces noise and transients in the output. 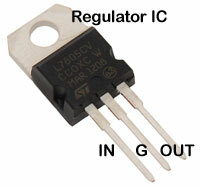 78XX series IC s are Positive voltage regulators and 79XX series are Negative voltage regulators.